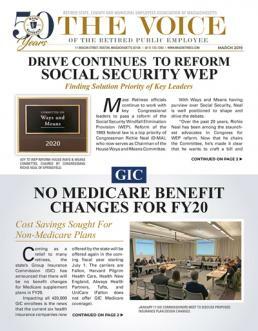 The nationwide effort to reform Social Security’s Windfall Elimination Provision (WEP) has taken on a renewed sense of urgency, with impacted retirees renewing their calls for Congress to act during the current session. Last year, Mass Retirees and our coalition partners came close to advancing legislation in the U.S. House of Representatives that would have reformed the WEP law for those now eligible for Social Security. That bill, which then existed as H.R. 711, expired at the end of 2016 and has not been refiled as stand-alone legislation. As previously reported, WEP reform lead sponsors Congressmen Kevin Brady (R-TX) and Richard Neal (D-MA) continue to seek a legislative vehicle in which to pass a bill during the current Congressional session. Ideally, such a bill would be acted on in the House this fall. By now Mass Retirees members are familiar with the efforts underway in the seven states that are primarily impacted by the WEP and its companion law, the Government Pension Offset (GPO). What is less well known is the fact that the two offset laws impact segments of public retirees in all fifty states. For instance, two-thirds of all public school teachers are outside of Social Security and impacted by WEP and/or GPO. One such retired teacher is Velma Williams of Lexington, Kentucky. Despite having been a career educator, Velma worked and earned more than forty-quarters in the private sector and qualifies for Social Security. But like the more than 1.7 million retirees impacted by WEP around the country, her Social Security benefit has been unfairly reduced due to the WEP law.